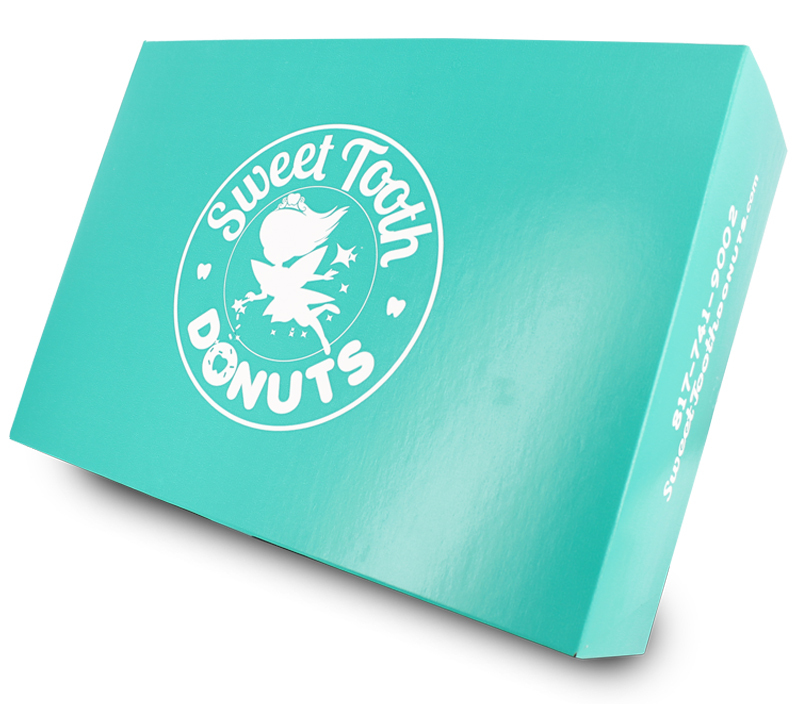 Custom-printed packaging is important for every business, and that includes bakeries. It can help get a company’s name out there, or increase brand recognition, and ideally it will drive traffic to your location. So we hand-picked a few of our favorite custom orders to share because we found them to be smart, eye-catching, and unlike their competitors. Branding is at its best with the same logo printed across multiple platforms. Perhaps the strongest, most successful way to get your name out there is with cohesive branding across multiple items. This demonstrates a consistency in style and an emphasis on brand recognition. And it increases the chances of being noticed when a business has their logo on various packaging products. Does your packaging leave a lasting impression? Be distinct, be unique, and create custom printed packaging that perfectly reflects your brand, its style, and its message. Stand out from the competition with all-over printing. This also ensures that the custom logo is seen from any angle. An allover design adds a certain liveliness to any packaging, and is sure to be memorable to all who see it. Go bold with full bleed color in your company’s specific Pantone hue. Does your bakery or cafe have a Pantone color in the logo? If so, you’ll want to make sure that your perfectly picked pigments remain consistent throughout all your branding, including your custom packaging. Picture it: a customer walking down the street carrying your instantly recognizable box, the one that matches your bags and your logo and your website. Perfect harmony! Sometimes the boldest look is also the simplest one. A logo doesn’t need to be complicated to be fancy. Many of our favorite designs are simple, striking, and memorable. 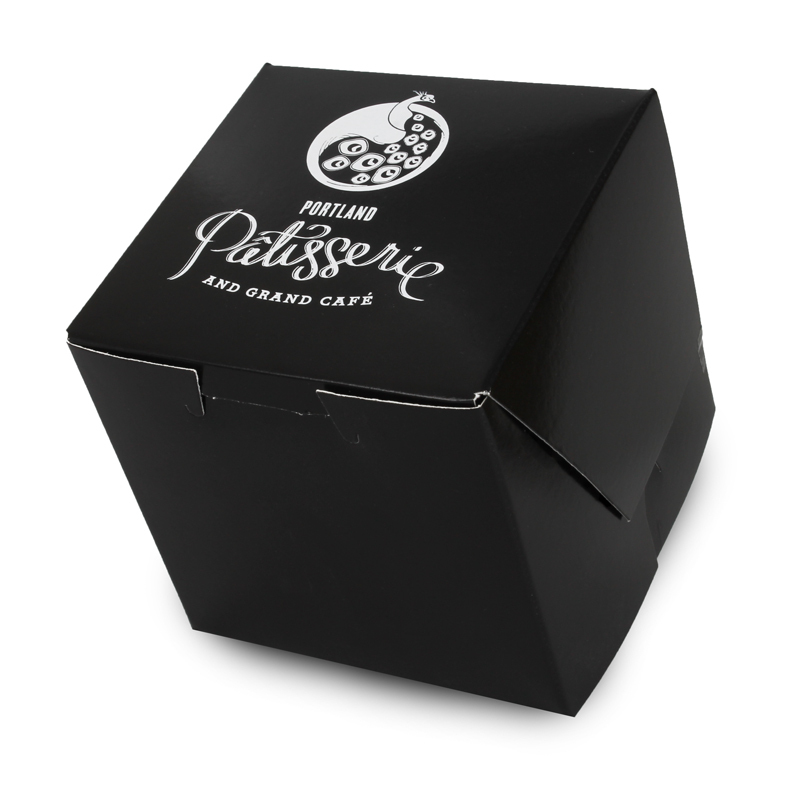 Take, for example, the Portland Patisserie, which has white film hot stamped onto black pastry boxes. The image is clear and the bakery’s name is easy to read. 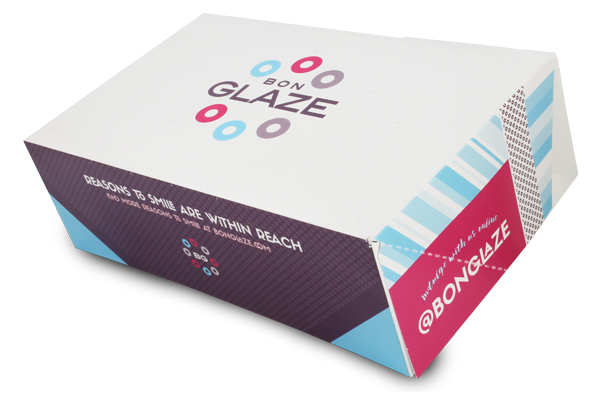 Interested in learning more about how to create custom packaging for your business? Call one of our packaging specialists at 888-321-2248. Prev Article: Pop Quiz: How Well Do You Know Your Eco-Friendly Icons?